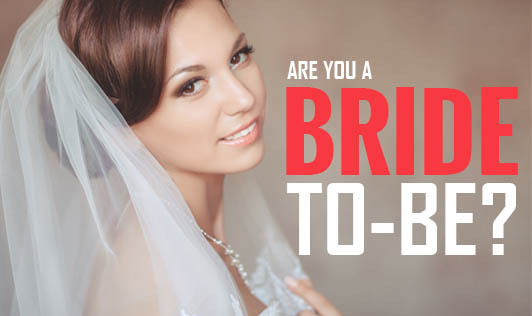 A bride-to-be is the one who has to look most beautiful on the wedding day. There are no good quick-fixes to look good on your wedding day. You must begin two months in advance, if you want to look resplendent and glowing. 1. Go for a weekly body massage: Body massages include cleansing, scrubbing and massaging all over the body. This would make your skin glow by getting rid of dead cells and making your skin look healthy. 2. Weekly manicure and pedicure: A herbal treatment on your nail and skin of hands and legs are very much essential. This will ensure an even skin complexion and tone throughout your body. 3. Hair spa: Go for a hair treatment once in two weeks. A hair spa will include oil massage, applying serum, and many other key ingredients to make your hair shine and healthy. 4. Facial treatment: A facial treatment should be done weekly twice. A good massage on your face will remove stress and reduce marks and dark circles from your skin. 5. A good diet: Diet also plays a chief role to keep you healthy. Eat well, avoid deep fried, shallow fried, and sweet dishes on a regular basis. Eat healthy, do not skip meals, and do not over eat. Include salads, sprouts, and egg, whole grains etc in your diet. Try to eat home foods as much as possible. 6. Don't forget to exercise: Exercise will aid in weight loss and help you stay fit. Before your wedding, you will have to look totally fit and in shape. 1. Pricking your pimples: This can spoil your skin and make marks on it. 2. Hair drying: drying your hair using a hair drier can induce hair fall and tangles in your hair. Instead, use a towel and wipe it mildly. 3. Sleeping without removing make-up: This can spoil your skin and create wrinkles near the eyes. Your wedding day is the best day in your life. Enjoy all the occasions and special attention that you get. Plan your beauty and fitness treatment well ahead and look your best!